Mellow, organic farmhouse cheddar made by the Green family in Somerset – the land where cheddar began. Produced from pasture-fed cow's milk, cut and turned by hand, and aged on the farm. With a smooth, well-rounded flavour to appeal to all palates, this cheddar is a cheese board staple and makes a particularly fine cheese on toast. Prefer something stronger? Try Greens of Glastonbury’s mature cheddar. Keep refrigerated - serve at room temperature. This cheese is made by Longman’s dairy, following the Greens of Glastonbury traditional family recipe. 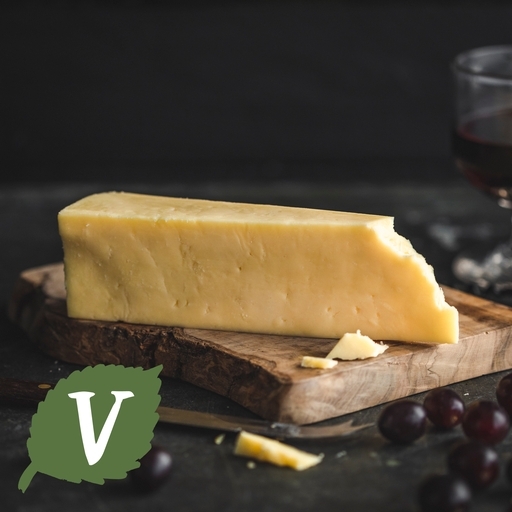 The Longmans have been farmers and farmhouse cheesemakers for over 200 years and have a wealth of expert knowledge, while Green’s of Glastonbury are renowned for their organic cheeses, even counting members of the Royal family amongst their fans. These two ancient Somerset dairies have come together to produce something really special. Pasteurised cows' milk, starter culture, vegetarian rennet.